Mary Maxwell (Joe's wife/helpmeet/enabler) working the checkout counter, with Melanie Blattenberger next to her and the Mrs. of Mr. Greg Rodney (of Southridge CNC C/L kits) sitting on the stool. 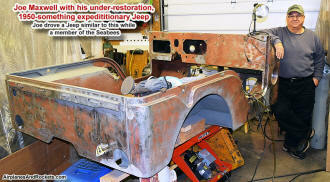 Joe Maxwell with his under-restoration 1950s-era expeditionary Jeep. 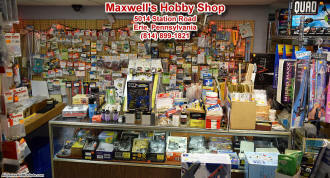 Maxwell's Hobby Shop model rocketry supplies. 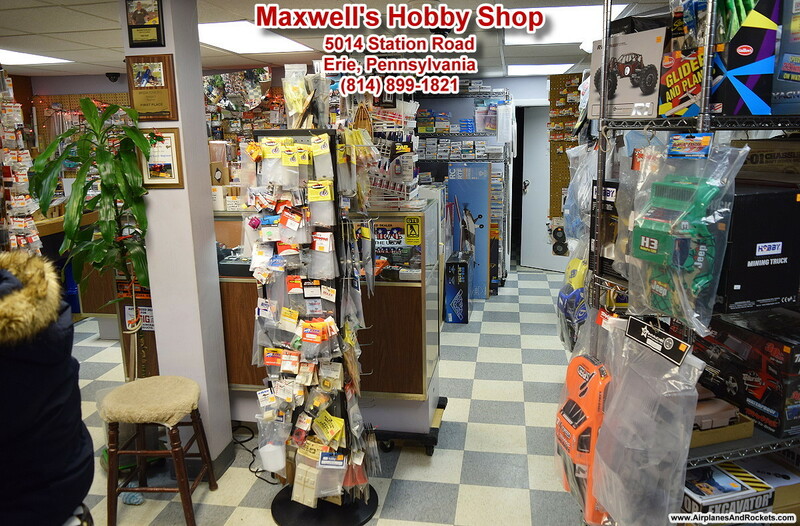 Maxwell's Hobby Shop engines, motors, radios, batteries, chargers, building supplies, hardware, & replacement parts. 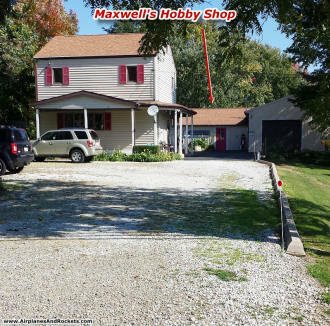 Maxwell's Hobby Shop is owned and run by Joe Maxwell and wife, Mary. Joe (a very nice guy) has been operating his eponymously named hobby shop in Erie, Pennsylvania, for many decades. The 600 sq. ft. shop is stuffed to the gills with kits and equipment for all types of aeromodeling, including free flight, control line, and radio control. 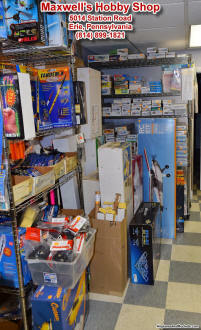 There are many supplies for boats, helicopters, multirotor drones, and cars as well. 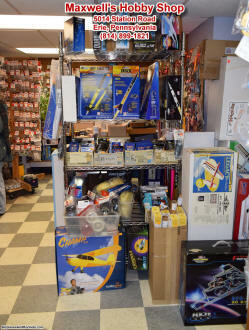 Joe is an avid control line flyer and a member of the Bean Hill Flyers control line club, so there is a very nice stock of control line accessories. Rather than bore you with writing about all the great stuff in Maxwell's Hobby Shop, these high resolution photos - each the equivalent of 1,000 words - will do a better job. 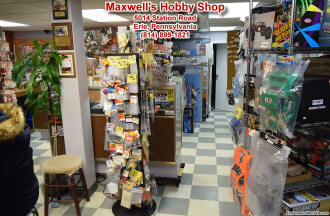 Maxwell's Hobby Shop control line accessories. 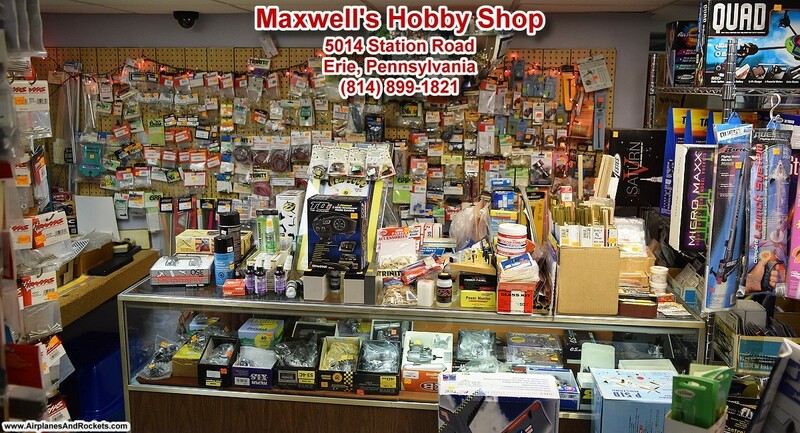 Maxwell's Hobby Shop paint, dope, & Monokote stock. 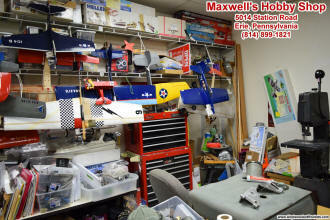 Maxwell's Hobby Shop free flight, control line, and radio control kits, RTF airplanes, helicopters, & drones. 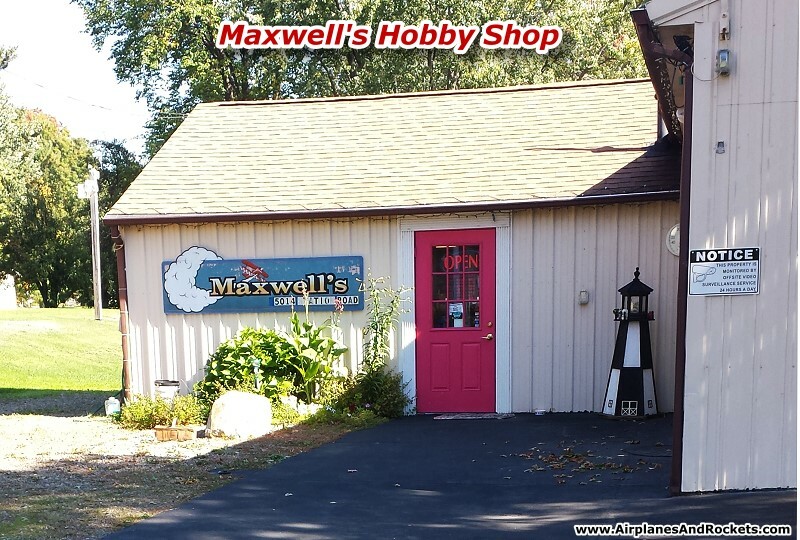 Maxwell's Hobby Shop is located just a mile north of I-90 exit 32, on 5014 Station Road. 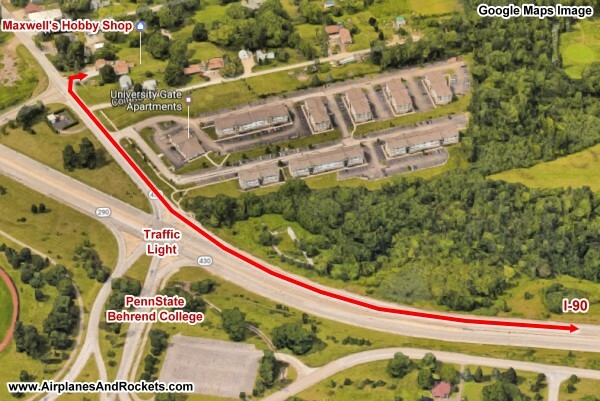 Turn right at the traffic light across from the PennState Behrend College campus, then go about 600 feet and look on the right for the 2-story brown house, just past the blue Colt (road) sign. 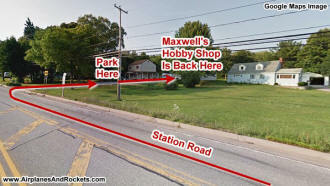 The hobby shop is in the building just beyond the house (it puts you right in front of Maxwell's). If you are travelling south from the city, be sure to use the left turn lane a few hundred feet before the stop light. See the maps below. 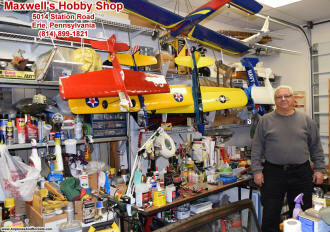 Joe Maxwell in his hobby amply supplied workshop. 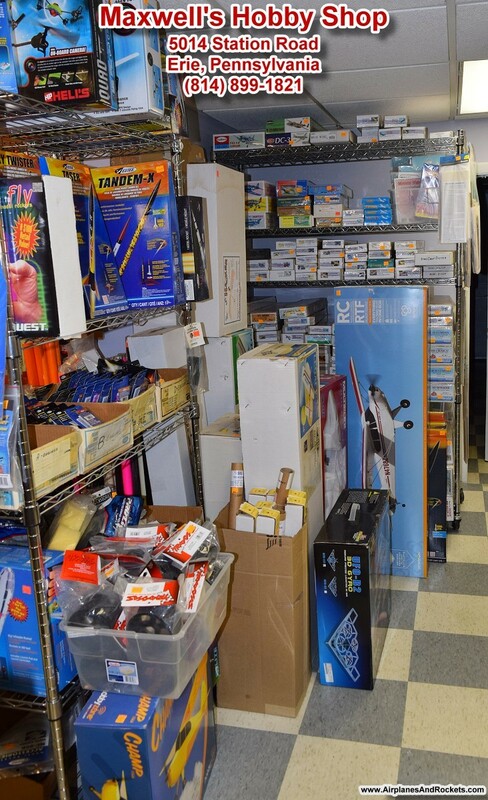 Joe, again, in his hobby amply supplied workshop (note the battle boat on the shelf). But wait! That's not all there is to Maxwell's Hobby Shop. 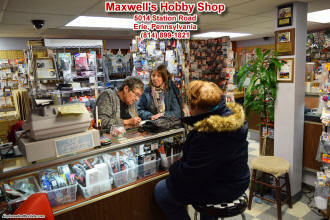 As I mentioned earlier, Joe is a very active modeler as well as a hobby shop owner. 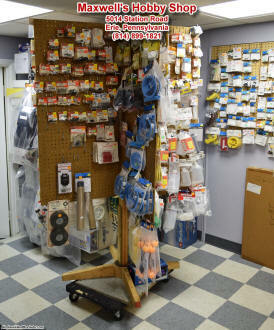 With very little effort, you can easily get Joe to give you a tour of his workshop. 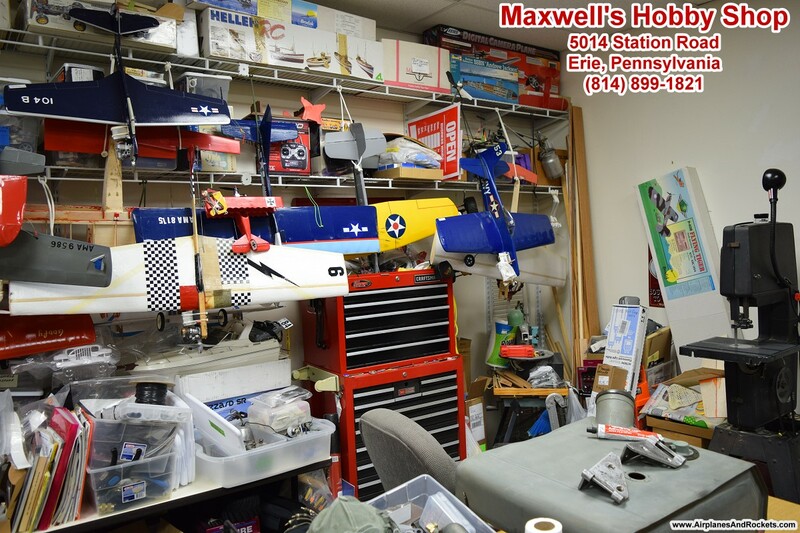 Uncountable (or so it seems) examples of model airplanes, cars, and boats sit on shelves surrounding the work bench and power tools. 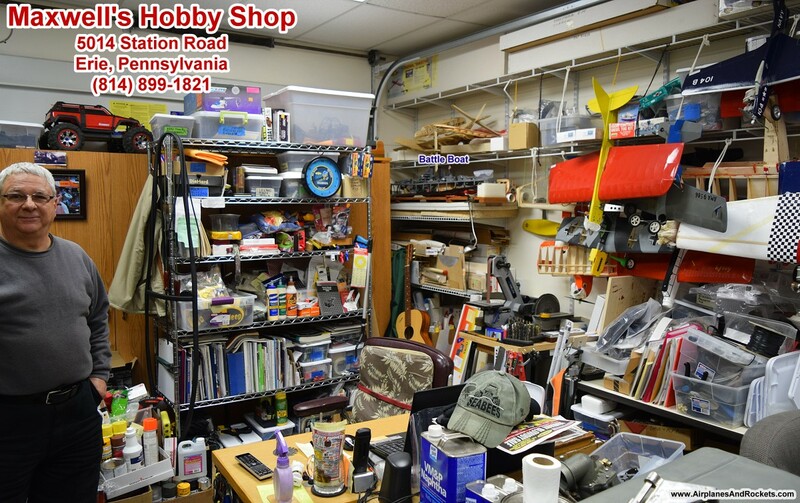 Note in the one photo there is an RC Warship Combat model that has seen many battles. 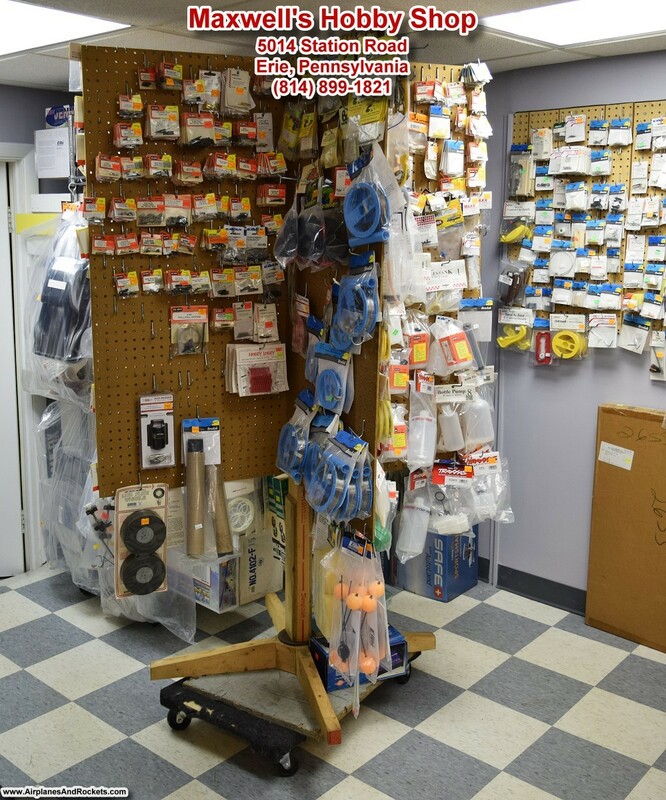 Look closely and you will find examples of just about every sort of modeling activity ever invented. 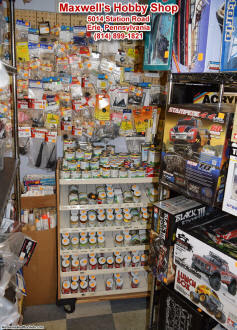 More of Joe's hobby workshop. 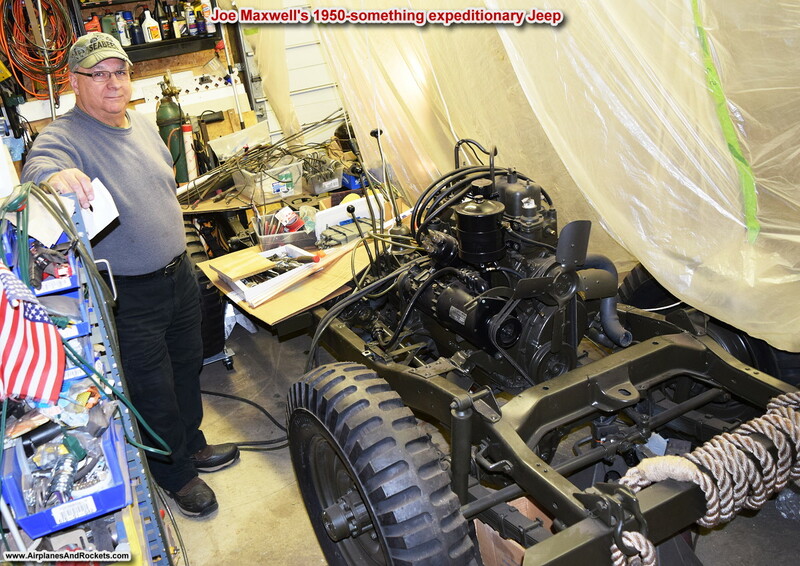 Of course you probably noticed the photo at the top of the page with Joe Maxwell standing next to the 1950-era expeditionary Jeep that he is restoring. It is similar to one Joe drove while serving America as a Navy Seabee (note his hat) in various locations throughout the world. He has already reconditioned much of the frame, suspension, engine, electrical and fuel system, but there is still a lot of work left in fixing the rust holes and straightening dents before all the parts get bolted and screwed back together. 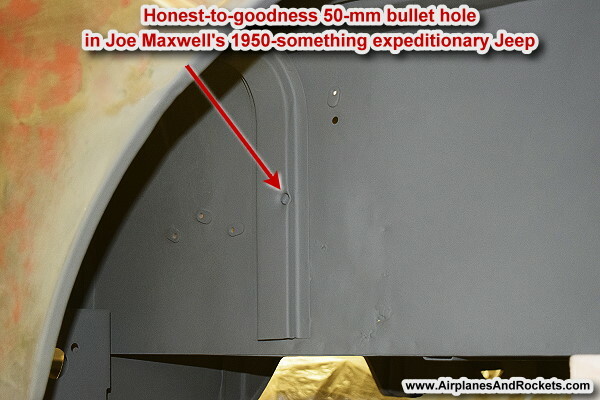 Plans include restoring the engine snorkel system that allows it to run submerged and also a faux machine gun behind the seat. This Jeep came from a fire engine company in Michigan. 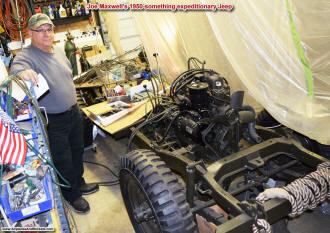 Joe Maxwell with the frame, suspension and engine of his 1950's-era Jeep. That's a real 50 mm bullet hole in the right rear wheel well!